Specializing in plastic round rod and rods (aka: plastic dowel, plastic pin and plastic round bar); Industrial Plastic carries a huge variety of materials in round rod. Most materials are available in 96″ or 120″ lengths, however we normally cut these rods for shipment via UPS. Our plastic manufacturers are some of the best and largest in the industry and make the finest plastic rod and round rods available. We source only the best materials from American sources without any imports from China. Our plastic rods have the least amount of residual stress in the industry – providing the most consistent plastic rod, and thus the best finished parts. Still not sure which product is the proper material for your application, consult our free Plastic Materials Selection Guide. If there is a material not listed, please call. It might be in stock, but not on the website. 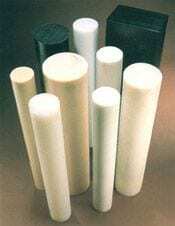 While this is a large list of materials, we do stock dozens of additional materials in plastic round rod. Contact us today for your plastic rod requirements.